Renting a Dumpster in Hollywood is a breeze. You can keep your rental up to 7 days and schedule delivery whenever you would like. From film sets to the Hollywood Hills, we’ve got your service needs dialed in. Our bins arrive on small pick up trucks, making tight alleys, streets, and driveways not a problem to get the job done the correct way. 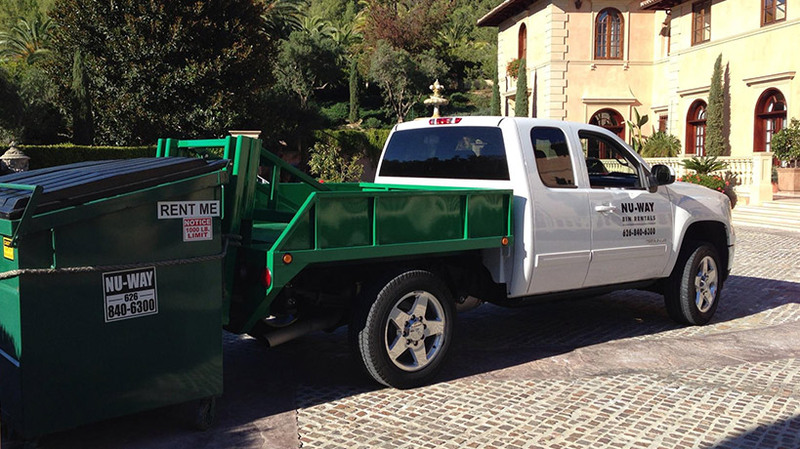 For more information on our Hollywood Dumpster Rentals. Hollywood is one of the most famous neighborhoods in Los Angeles County, California, and remains the epicenter of the film industry. The diverse neighborhood is known for its many notable residents, venues, and landmarks, including the Hollywood Sign and the Hollywood Walk of Fame. Hollywood plays home to numerous film studios, including MGM and Warner Bros. Residents of this well-known neighborhood know to rely on the experienced team at NU-WAY Bin Rentals for all their dumpster-related needs. Garbage bins are 5 feet high, 6 feet long, 4 feet wide, and include locking lids. Call (626) 840-6300 for more information. Whatever the scope of your project, allow the friendly team at NU-WAY Bin Rentals to make it easier via high-quality trash bins. The company accepts all credit cards, and team members are always available to dispense free advice or answer questions. For more on dumpster rentals in Hollywood, please contact NU-WAY Bin Rentals today.